“Visionaries see a future of telecommuting workers, interactive libraries and multimedia classrooms. They speak of electronic town meetings and virtual communities. Commerce and business will shift from offices and malls to networks and modems. And the freedom of digital networks will make government more democratic. Much of the skepticism is fueled by tweeting commentators that have placed a magnifying glass on Bitcoin’s developers and early adopters. Perhaps it’s due to the over $800 million in VC investment that’s poured into the digital currency space. Or that the market cap of Bitcoin is hovering around a not-insignificant $4 billion. Perhaps it was Silkroad or Mt. Gox. Whatever the reason, a sizeable gap has emerged between public awareness of Bitcoin and public understanding of it. A significant portion of those profits are driven by areas Bitcoin is poised to tackle by allowing for secure, instant peer-to-peer transactions at zero to low cost. And doing it without any central authority or banks. Nobody owns or controls it. Hence its most notable characteristic: decentralization. Many others have described use cases for Bitcoin at length. From international money transfers to micropayments, its utility is being showcased around the world. Looking beyond this, Bitcoin emerging as a global network is one of the most exciting developments. The folks at Stripe wrote about this in detail, mentioning that “one exciting consequence of having a network of gateways built on top of Bitcoin is that they’ll all be technology-driven companies in an open ecosystem” – essentially creating an IP layer for payments. Moreover, large financial institutions are able to take advantage of a centralized model, requiring a middleman for every transaction. This advantage extends to sophisticated trading institutions and many other incumbents that are able to derive benefits from the large pool of assets under their management. Earlier this summer, NASDAQ announced it would be using Bitcoin’s underlying technology, the blockchain to drive its new private share-trading market. This technology can begin to make trades significantly faster, and save a significant amount of collateral and settlement costs – some estimate up to $20 billion in savings by 2022 . Running trades off the decentralized blockchain would also begin to reduce risk, as well as create additional liquidity. A new start up, SmartContract, is already building products utilizing this technology to create so-called “trustless agreements” that can securely facilitate a variety of transactions. The Secure Assets Exchange is just one example. It is worth noting that 2014 marked the first year time in the past 5 years that annual bank profits fell. This happens to coincide with a rapidly emerging fintech revolution - over $3 billion was invested into the fintech sector in Q4 of 2014, across 214 different deals. A number of savvy banks have set up their own incubators in an effort to evolve and/or from fear of having a number of their profit lines rendered insignificant. While mass adoption of a digital currency may take some time, a number of innovations have made dents in the financial services arena, much to the benefit of the everyday consumers. Personal investing is just one sub-set. Other companies such as Venmo, Boku, and Moven are examples of start-ups making dents in the way retail banking is conducted. It is unsurprising that many of the underlying principles that drove Bitcoin’s development are becoming prevalent, in bits and pieces, in many of the innovative start-ups mentioned above. Peer-to-peer transactions. Zero to low fees. Adaptability. Ease of use. Secure transparency. And perhaps most importantly, taking subtle steps towards decentralization. While the world waits for Bitcoin to mature into what the Wall Street Journal dubbed as “one of the most powerful innovations in finance in 500 years,”  these other technologies, apps, and products are providing powerful and effective alternatives to traditional options. This is, undoubtedly, a good thing. 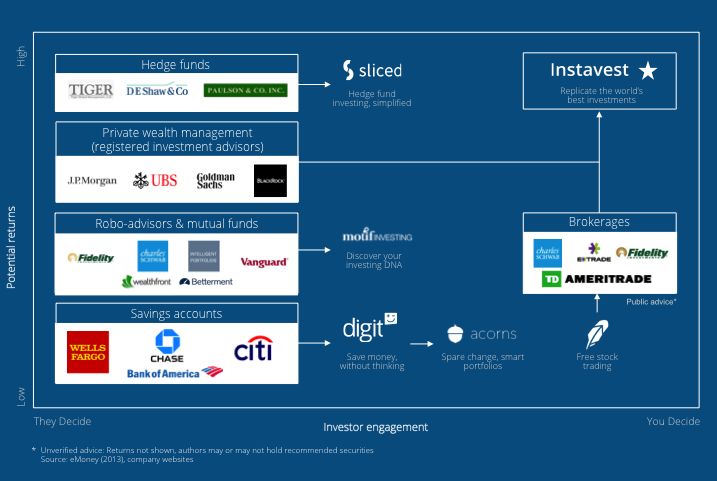 Sign up for Instavest where you can replicate the world’s best investments.